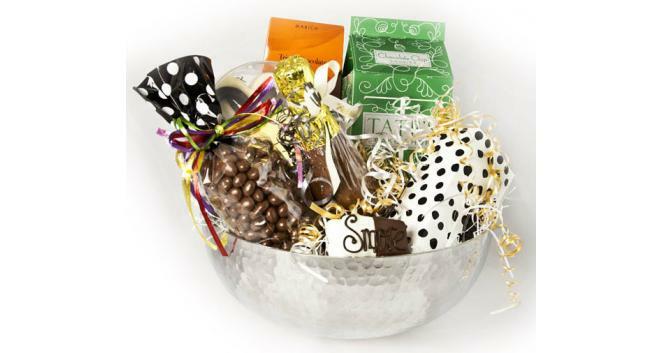 Go mad over this divided willow basket filled with Goodies finest chocolates. Chocolate covered mini grahams, kitchen sink bark, triple chocolate toffee bits and more are sure to overjoy even the most discriminating chocolate lover. Available in two sizes. Choose 1, 2 or 3 deliveries. 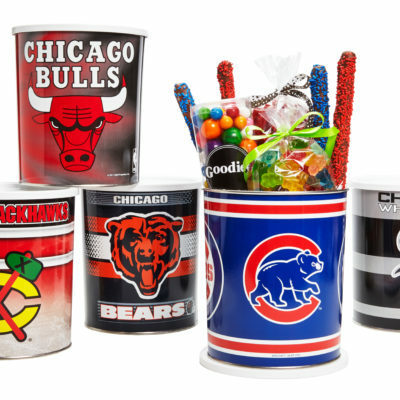 Chicago Sports fans (Cubs, White Sox, Bulls & Blackhawks) will enjoy these logo tins, filled with a variety of Goodies fun and delicious candy and treats. A perfect gift for birthdays, thank-yous, hostess and get well. 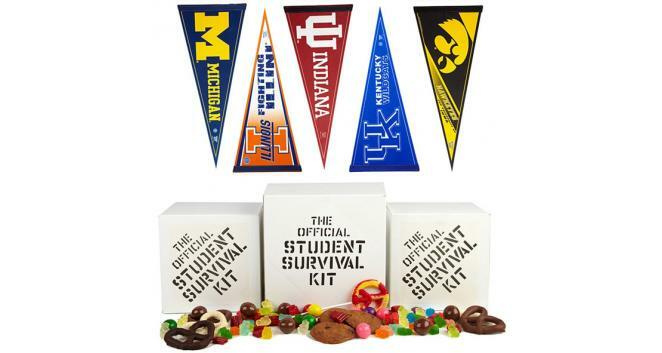 Please indicate your team choice in the special instructions on the shopping cart page. 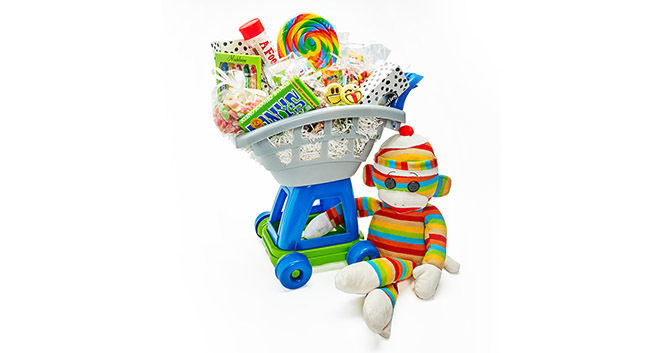 Welcome baby with a shopping cart bursting with a selection of Goodies finest chocolates and candies. This gift is sure to delight mom and provide baby with years of fun! Our best seller! 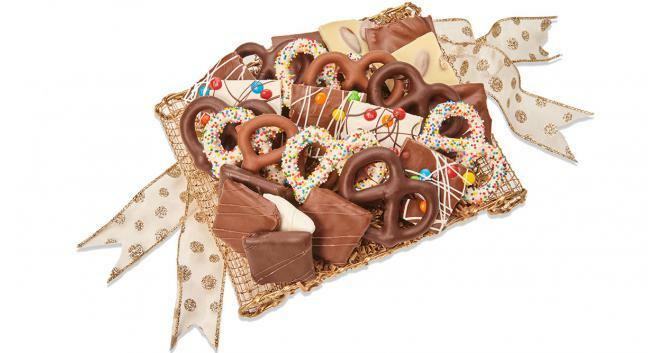 A basket filled with chocolate covered pretzels, English Toffee, Oreo bark, chocolate cherries and more. 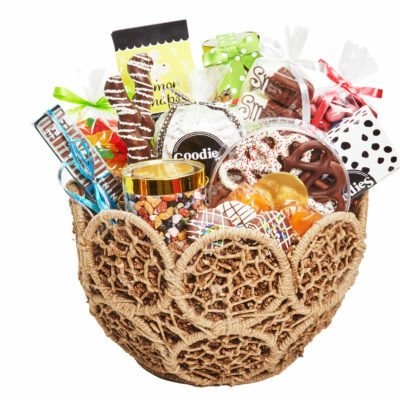 Wrapped in cellophane and beautifully bowed, the Goodies Signature Assortment gift basket is perfect for a group or for that one special person. Ideal for everyday gifting (corporate, birthday, congratulations, sympathy, shiva, retirement and get well). Available in four sizes $60 (12in); $80 (14in); $100 (16in); and $150 (18in). 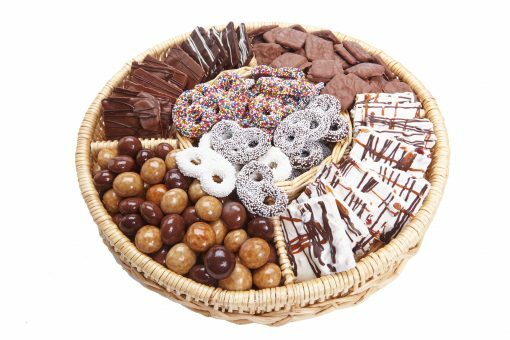 Give a tasty selection of our famous barks, toffees and chocolate covered pretzels, attractively presented on a gold mesh tray and finished with colorful ribbons. 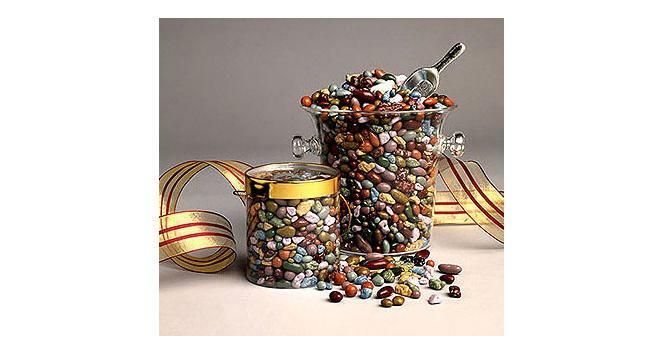 This gift is a chocolate lovers delight for any occasion. 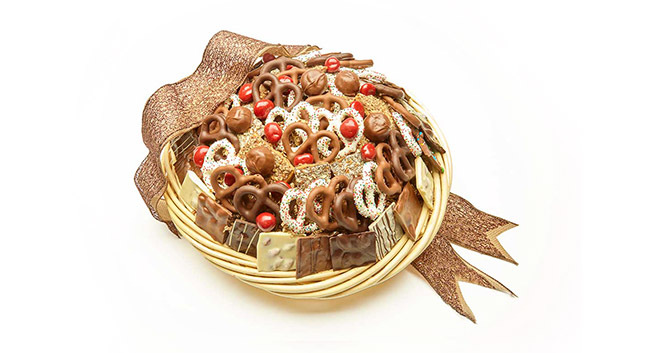 Add sparkle to someone’s day with this beautiful hammered metal bowl filled with our famous chocolate covered pretzels, gourmet cookies, chocolate dried cherries and other delectable treats. It is sure to delight!